Posted August 10th, 2014 by Lisa & filed under farro, the lighter side, tomatoes. I’ll admit it. I’m a little obsessed with farro. Okay, a little more than a little. I’m not quite sure what it is — the nutty, earthy flavor, its sheer versatility, or the fact that it’s so easy to prepare — but I keep coming up with ways to make it even better. Farro has more than likely been on my mind because it’s healthy. And-I-have-definitely-not-been-eating-so-healthy-this-summer. The thing is, I started a fantastic new full-time job and have been traveling quite a bit. Socializing with colleagues has been an amazing warm welcome, but it isn’t always the best for the waistline. Boo. So, when I am home, I try to cook as much as possible to avoid take out dinners and ensure I have “homemade” lunches for the work week. 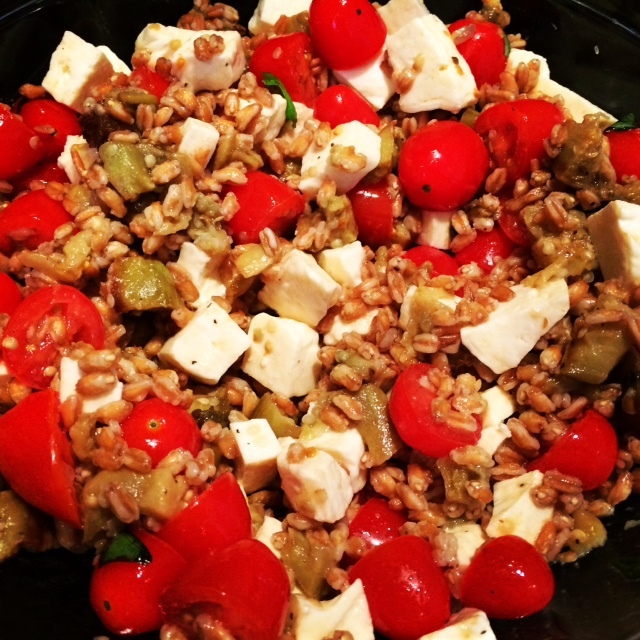 My latest farro creation is a perfect “meatless Monday” dish. It was not only delicious the night I ate it for dinner (warm), it made a fantastic lunch as a cold salad for a couple of days too. What’s not to love? Keep calm and farro on. 1. Rinse and cut grape tomatoes in half. In a medium bowl, toss with 2 tbsp. olive oil, salt, pepper and torn basil leaves. Set aside. 2. Boil 5 cups of water in a small saucepan for the farro. In the meantime, preheat oven to 400 degrees. Toss the cubed eggplant with 2 tbsp. olive oil, salt and pepper. Place eggplant on a baking sheet. Roast for about 15 minutes, or until it turns golden brown. Remove from oven, cool slightly and add to bowl with tomatoes. 3. Once the water begins to boil, add farro. Cook for 10 minutes or until soft, but not mushy. Drain and add to bowl. Add fresh mozzarella, and toss with farro, tomatoes and eggplant. 4. Serve immediately or chill and serve cold. Enjoy!